A Pen Addict reader mentioned that the new Power Tank Smart Series writes better than the original Power Tank, and the new High Grade model. Well, since I just happen to have all three handy, I did a quick little test to see if I could notice anything. 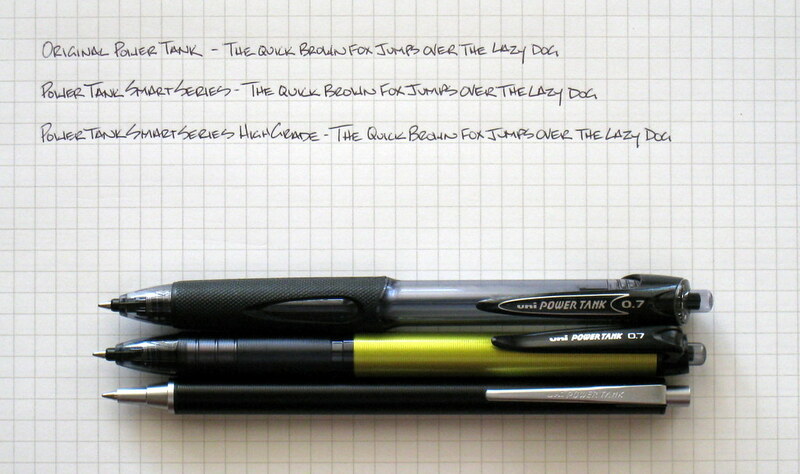 From this short one sentence test, I could tell a difference between all three pens. First off, the original Power Tank is easily the worst performer of the three. The line skips more (more white streaks) than the other two - by a lot. It isn't terrible on its own, but when put up directly against the other two, I could tell pretty quickly. Secondly, the reader may be right - the regular Smart Series model laid down a smoother, darker line than the High Grade cartridge. If you expand the picture, you can see the middle line is a little thicker and darker than the bottom line. That is the difference between the two. They are both very clean writers, and while they are both superior in performance to the original, I could clearly tell a difference between them. Posted on April 15, 2010 by Brad Dowdy.